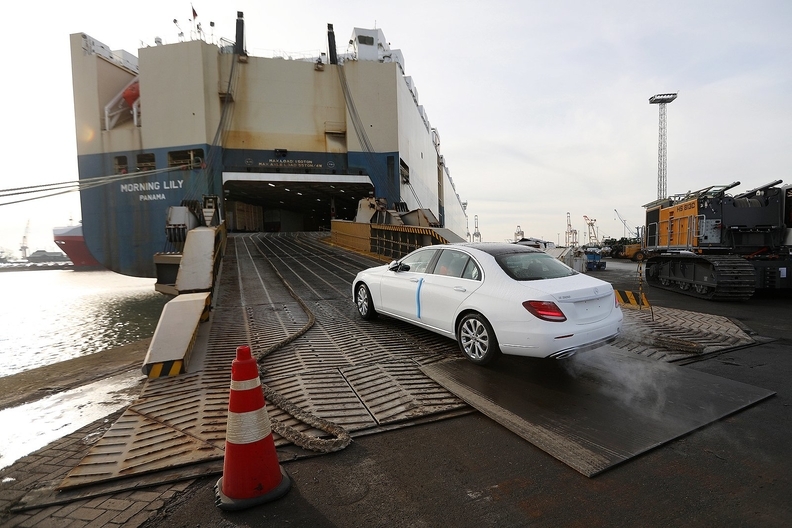 A Mercedes-Benz E-class sedan is loaded onto the carrier Morning Lily for export from the port of Bremerhaven in Bremerhaven, Germany, on Jan. 22, 2019. President Donald Trump has given European automakers a way to avoid an escalation of the trade war, saying they can avoid tariffs on light vehicles if they build more plants in the U.S.
Trump said that he would agree to zero-tariff levels on some trade with Europe but would not on autos without this concession. Trump answered “well, no” after he was asked whether foreign vehicles represent a national security threat to the U.S. -- the subject of a Commerce Department study Trump ordered last year. The findings have not yet been publicly released. German automakers have drastically increased light-vehicle production in the U.S. in the past decade with output in the U.S. far outweighing imports from Germany, lobby group VDA said. BMW's Spartanburg, South Carolina, assembly plant has become a significant source of output for the company as well as a major exporter, mostly to China. In addition, Sweden's Volvo Car Corp. operates an assembly plant in South Carolina. Trump also said in the interview aired Friday that if congressional Democrats do not ratify the U.S.-Mexico-Canada Agreement, his alternative would be to "maybe go pre-Nafta" with trade practices in North America. He’s previously made threats to terminate NAFTA in an effort to force Democrats into ratifying the agreement but he has not yet followed through. "I think the deal will probably happen; I think they need it very badly," Trump said. Pressed on whether the talks have hit a snag, he said they hadn’t: "No, not at all." As recently as early this month, Trump administration officials had spoken publicly of a Florida summit between Trump and Chinese President Xi Jinping as early as next week. Instead, those talks have been pushed back at least several weeks as a U.S. delegation heads to Beijing this weekend.